Posted on July 2, 2018. Subscribe to our blog by email. Panelists from L to R: Eric Klunder, Lynden International; Joe Gleason, AHT Insurance; Cassie Walker, International SOS; and Dustin O’Quinn, Lane Powell PC. (Photo credit: Cara Vallier for Global Washington). 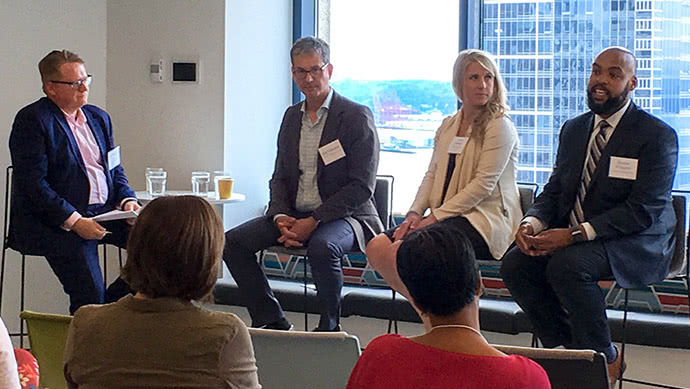 On Wednesday, June 27, Global Washington hosted a panel discussion about global travel risk, together with its member Key Travel, which provides travel and support services to non-profits globally. The event came just a day after the Supreme Court of the United States voted to uphold the travel ban against Iran, Libya, Somalia, Syria, Yemen, North Korea and Venezuela. Moderated by Eric Klunder, Lynden International Senior Account Executive, the panel of speakers included Joe Gleason, AHT Insurance Director of Risk Management; Cassie Walker, International SOS Business Development Manager, and Dustin O’Quinn, Lane Powell PC Shareholder and Immigration Team Chair. O’Quinn discussed first how the travel ban applies to non-U.S. citizens from one of the currently banned countries. First the ban prevents both immigrants and non-immigrants (including someone who would have travelled on a business visa with a corporate sponsor) from coming to the U.S. For those who are already in the United States from one of the banned countries, they feel somewhat like they’re prisoners because of how unlikely it is that they’d be allowed back into the country if they left. In 2017, O’Quinn said he noticed that whenever a new version of the travel ban would be released, another immigration policy change would come out within 24 to 48 hours that was not covered in the news as much, but that affected far more people than the travel ban. The number of changes, including for legal immigration “has been astounding,” he said. In response, O’Quinn said companies are now opening offices in Canada so that if their employees working under H-1B visas find themselves unable to get back into the United States after traveling abroad, they can at least work out of the Canadian office. Sometimes it can take as long as a year or more for them to be readmitted. In addition to the travel ban and other policies that have made it more difficult for non-U.S. citizens to visit the United States, panelists also talked about risks to travelers from the U.S. going abroad. Only 11 countries currently rank a level four, but there are also many two’s and three’s (surprisingly, Paris is a two). Many countries, O’Quinn said, have since reached out to the State Department to ask how they could get their level changed. For Americans traveling outside the U.S., Walker described some of the trends her organization is seeing. She began by noting that International SOS conducts an evacuation on average every 30 minutes. And while International SOS has not changed the threshold for the travel alerts it issues, the number of concerns in low- and medium-risk countries has gone up. Nevertheless, the number of international travelers has also continued to increase. The conversation then turned to what’s referred to by global travel specialists as a “duty of care” that organizations have for their employees, which entails taking “reasonable measures” to prepare for foreseeable risk. Walker noted that “duty of care” norms continue to evolve, as do the risks. Gleason used as one example the case of a Norwegian Refugee Council employee whose convoy had been ambushed in Kenya. He was kidnapped and held for ransom in Somalia. Later released, he sued his organization and NRC was found to have been grossly negligent in its duty of care. The ruling has since been called a “wake up call” for the aid industry. As far as recommendations, Gleason suggested that organizations implement “travel tracking” as a best practice to make sure someone in HQ knows where all staff are traveling at any time. Additionally, for those working in the aid industry, he recommended providing staff with psycho-social support and “after-care” for those who have experienced traumatic events. This is an area that’s gained increasing attention, he said, and organizations should prepare to meet their obligations.